Parents really know how to make other parents laugh, and that is certainly what Peggy Ward, parent and writer of Mamaphobia Trio did for Kat and I on a recent, much needed night out. Peggy and her cast members, Jeff Hackl and Mary Poole, totally made us laugh, let our hair down, and forget the craziness in our lives. Peggy Ward really nails the crazy and comical moments of early parenthood on the head. However, while she definitely had us laughing, she was also able to touch our sentimental side. 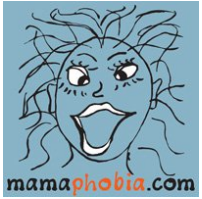 Mamaphobia is rich and layered--multi-dimensional like parenthood itself. Besides being a comedy, Mamaphobia is about a young mother beginning parenthood very unsure and tentative yet somehow emerging as a confident parent learning to enjoy the little moments because they pass. In some ways, Mamaphobia seemed to be scripted from my life. There were many times that Kat and looked at each other with those knowing glances--yep, you did that---yep, my husband reacted the same way---uh-huh, that is me. The show was both comical and sentimental at the same time. When Jeff, as the husband, John, leaves to take the kids out and only puts one diaper in his back pocket, I think of how my own husband is much more laid back than I am. As Mary, the young mother, grows from being paranoid about every peep to realizing that, yes, everything is going to be alright, I think of myself going from the mother that took pains to not let my daughter fall to the mother that isn't worried if her daughter is running around with a bloody knee or two (it's just blood, right?). The multilayered nature of Mamaphobia makes it so relatable--to mothers and fathers, young and old, new and "experienced." Just a quick glance around the audience told me the power of this performance. Everyone got it--and loved it! This show is really great for a little escape or a night away. Let's face it--we are going to talk about our kids when we go out anyway, so we might as well laugh! Peggy Ward's Mamaphobia does a good job illustrating the reality of new motherhood - both the joys and the chaos. I found many moments that rang true: the insane lactation consultant, the sleep deprivation, the desire for adult (any adult!) conversation, and so on. I thought performer Mary Poole was excellent at characterizing a new mom trying to get the hang of her new lifestyle. Along the way she finds unexpected surprises (her OB telling her to sleep when the baby sleeps. Oh, you've got another young child at home? Quoth the doctor, "You're fucked!"). But her life also yields some touching moments when she expresses her love of her child/children. We know that many of you are in need of a recharge (especially with school just starting). Peggy Ward and Mamaphobia Trio have been so generous to give us 2 tickets to the Thursday, September 6, 2012 show at 8PM and 2 tickets to the Friday, September 7, 2012 show at 9:00PM to give away to some lucky readers! I am sure this production is just what some of you need for a little pick-me-up! To enter to win the tickets, please check the raffle information below. The giveaway will end on August 28, 2012. For October ticket giveaway, click here. *Please note that the Laughing Chameleon has a 2 drink per person minimum. **Disclosure: We received complimentary tickets to Mamaphobia in order to write an accurate review as well as tickets to giveaway. We did not receive any monetary compensation. All opinions are 100% our own. This sounds so fun! I'd love to take my husband...date night! I would love to take my friend!